JNN 06 Mar 2014 Kiev : The Crimean parliament has voted for the region to join Russia. The decision will only come in force if approved by the Crimeans at a referendum which will be held in 10 days. Crimean MPs voted on Thursday for the region to “to become part of the Russian Federation as its constituent territory,” says the text of the regional parliament’s statement. 78 MPs said yes to Crimea joining Russia, while 8 abstained from voting. The speaker of the Crimean parliament, Vladimir Konstantinov, explained that the parliament’s decision on the region joining Russia still has to be approved at a referendum, which has been scheduled for March 16. That’s two weeks earlier than announced last week. There will be two questions on the Crimean referendum ballots. “The first one: Are you in favor of Crimea becoming a constituent territory of the Russian Federation. The second one: Are you in favor of restoring Crimea’s 1992 constitution,” the autonomous region’s First Deputy-Premier Rustam Temirgaliev said. According to the 1992 constitution, the autonomous republic is part of Ukraine but has relations with Kiev, defined on the basis of mutual agreements. The variant which gets the simple majority will be the winner in the referendum. Sevastopol residents will take part in the referendum, despite the city enjoying a special status and not officially being a part of Crimea, according to Sergey Shuvainikov, a Crimean MP. “We will give Sevastopol an opportunity to have its say,” he said, as cited by RIA Novosti. Kiev has reacted by describing the referendum illegitimate. “My position is that this referendum is unconstitutional,” the coup-imposed Ukraine’s economy minister, Pavlo Sheremeta, said as cited by Reuters. “They are forced to work facing the barrel of a gun and all their decisions are dictated by fear and are illegal,” Turchinov’s spokeswoman said. Crimea’s authorities have meanwhile announced that they are ready to nationalize all Ukrainian state enterprises and introduce a ruble zone in the region in case the referendum decides in favor of joining Russia, according to Interfax. 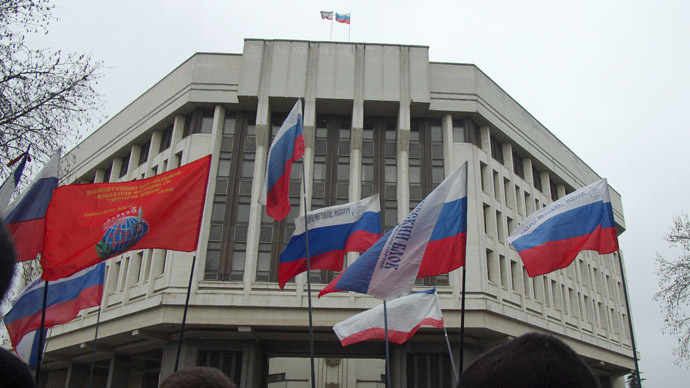 Russia’s State Duma (parliament) is ready to consider the possibility of Crimea joining Russia, according to the head of the Duma committee on the affairs of the Commonwealth of Independent States (CIS), Leonid Slutsky. “The State Duma will consider any bills concerning this issue when the referendum has taken place and when the Russian leadership has made a decision on it,” Slutsky said as cited by RIA Novosti. Meanwhile, the Crimean authorities said they were still negotiating a way out of the current crisis with the OSCE. The speaker of the Crimean parliament, Vladimir Konstantinov, said talks were under way and more were still to come. More than half the Crimean population are Russian and use only this language for their communication. Russian President Vladimir Putin said Moscow reserves the right to use all means to protect Russians in Ukraine as U.S. Secretary of State John Kerry arrived in Kiev. In his first comments since Ukrainian President Viktor Yanukovych fled Kiev, Putin said he considers him to still be Ukraine’s leader, and hopes that Russia won’t need to use force in predominantly Russian-speaking eastern Ukraine, AP reported. He also said that Russia would only use military force in Ukraine as a last resort, in remarks apparently intended to ease East-West tension over fears of war in the former Soviet republic. He rejected the Western threat to punish Russia with sanctions over its action in Ukraine, saying they will backfire against the West. Earlier Tuesday, the Kremlin said Putin had ordered tens of thousands of Russian troops participating in military exercises near Ukraine’s border to return to their bases. The massive military exercise in western Russia involving 150,000 troops, hundreds of tanks and dozens of aircraft was supposed to wrap up anyway, so it was not clear if Putin’s move was an attempt to heed the West’s call to de-escalate the crisis that has put Ukraine’s future on the line. The shots reflected tensions running high in the Black Sea peninsula since Russian troops – estimated by Ukrainian authorities to be 16,000 strong -tightened their grip over the weekend on the Crimean peninsula, where Moscow’s Black Sea Fleet is based. Meanwhile, the Obama administration readied economic sanctions against Russia on Tuesday as it formally announced an aid package of $1 billion in energy subsidies to Ukraine amid worries that Moscow would extend its military reach into the mainland of the former Soviet republic. U.S. Secretary of State John Kerry arrived in Kiev for a five-hour show of support for the fledgling Ukraine government as it grapples with a military takeover of Crimea. Kerry also was to pay homage to the dozens of protesters who were slain Feb. 20 in anti-government demonstrations that days later ousted Yanukovych. A Kremlin aide said on Tuesday that if the United States were to impose sanctions on Russia over Ukraine, Moscow might be forced to drop the dollar as a reserve currency and refuse to pay off any loans to U.S. banks, Reuters reported. Sergei Glazyev, an adviser to the Kremlin who is often used by the authorities to stake out a hardline stance but does not make policy, added that if Washington froze the accounts of Russian businesses and individuals, Moscow would recommend that all holders of U.S. treasuries sell them. Russia’s agricultural oversight agency issued a statement Tuesday declaring the reversal of its earlier decision to lift the ban on imports of U.S. pork. It said the existing U.S. system of checks don’t guarantee its safety. Putin’s economic advisor, Sergei Glazyev, said that Russia can develop financial ties with other nations to offset any potential Western sanctions. This entry was posted in Europe and tagged Crimea, Crimea Parliament, president putin, Refrendum, Revolution, Russia, Ukraine. Bookmark the permalink.